Hi Seth, That is an interesting chart. Is it created purely from Volatility ETPs or are you also looking at VIX futures and/or SPX options in general? 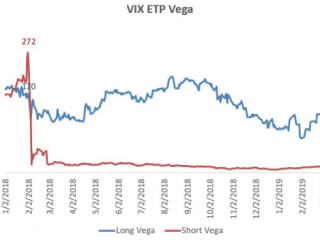 One thing that has always confused me for every future or options position there is a buyer and a seller so if the net vega position is zero how can you tell what the commercial position is? This chart is strictly sponsor holdings/commerical. Can accrue the input from ETP holdings as well as tracking CFTC data over time.